Brandon Copeland explains why spaces like his D.C. studio are essential to black wellness and culture. 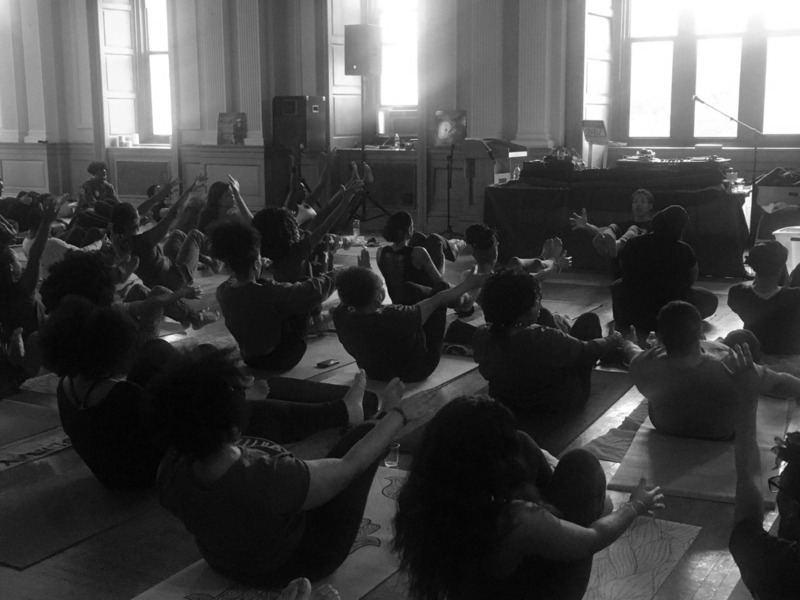 The practice of Yoga is usually associated with silence, but in instructor Brandon Copeland’s classes, he challenges his students to find inner peace over booming rap beats. 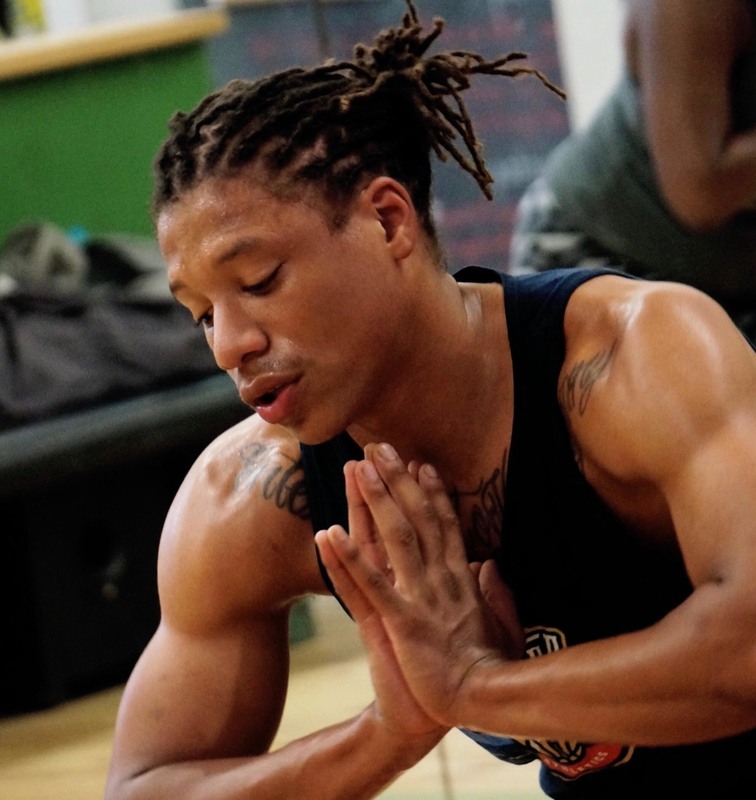 In 2013, the 26-year-old opened a Washington D.C.-based yoga studio, Khepera Wellness, after feeling like the essence of black culture was being excluded from majority-white yoga spaces in the area. The outcome: Trap Yoga — a course intended to both challenge the limits of one’s physicality and speak to the culture’s inherent spirituality. 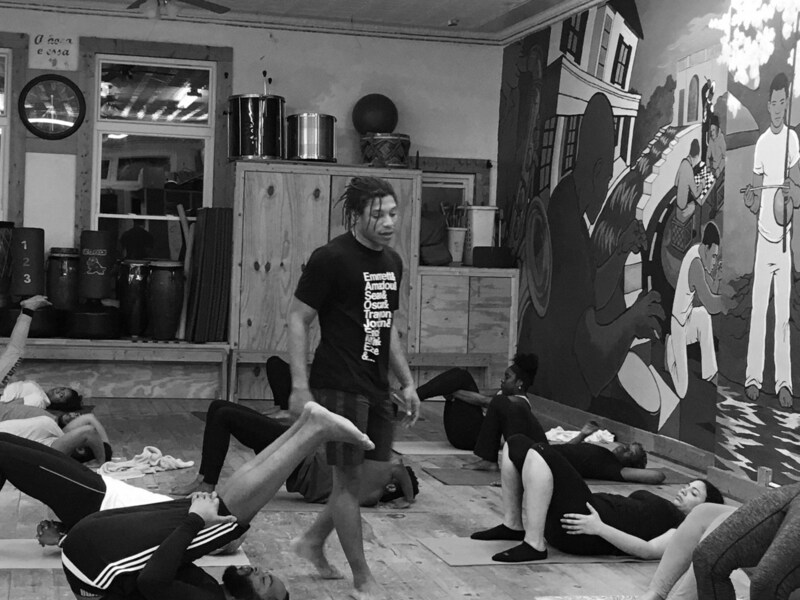 In addition to Trap Yoga, his most-popular offering, Copeland and his girlfriend and business partner, Lauren Turner, teach a Black Girl Magic class. It was developed in response to Sandra Bland’s 2015 death and the #SayHerName movement, a social justice campaign intended to raise awareness about the flood of black women who were senselessly killed by law enforcement in the last half-decade. During a phone conversation with The FADER, Copeland talked about the importance of restorative black spaces, holding yoga classes to cope with police killings in the black community, and why trap music is ideal for finding alignment. What first led you to the yoga practice? Brandon Copeland: I started doing yoga in 2010 when my girlfriend at the time asked me to try it with her. I was a junior at Howard University, and during my sophomore year, I found out that she was pregnant. I was taken aback and I didn’t know what to do. I was young and nervous about it, so I started to take the classes in order to be able to be calm and make decisions. Taking these classes was really the only place where I could feel kind of at peace with myself, and not worried about the future, or just the different things that you think of when you're young and you have kids and don't feel prepared. I practiced more and more heavily as her stomach grew, and once he [his son] was born I just realized how helpful it was for me. I also realized that I had a lot of friends that might be able to benefit from the same type of things that I was learning with wellness. So I took a teacher training at Yoga District, which is in the area by Howard. My sophomore year I started to teach classes on campus on the yard to spread it so that people would see yoga as something that was cool and that we could do. Trap Yoga is the opposite of traditional classes that are typically associated with silence. How did you realize that this was something that helped people with yoga, or that it would be beneficial to others? As I went on in my career, I found a style of yoga called Ashtanga Yoga that is notoriously more physically based, and more challenging in that way. It can get you to breathe and focus on your breaths for the first 5 or 10 minutes of practice, you'll probably focus for that amount of time through the rest of the practice and have a really good experience with or without music. That’s what the experience is really about but I found that it was really difficult to get people to do that. So, when I mentioned that I was listening to trap music when I did classes or when I practiced at home, or even put on Instagram, people were interested. Enough people were interested that on my 25th birthday, I threw a Trap Yoga class at the Lululemon in Georgetown, which for me was a really big deal because it felt really right. At the time I wasn't sure how the yoga community was going to take it. I was kind of apprehensive because I had gone to the same Lululemon a few years before, and they got me through a couple interviews, and I just wasn't what they were looking for. I didn't know how blackness would be accepted as far as a component to yoga, or if it’d be taken serious — I was really nervous. Later that year, I was able to get an opportunity to teach classes at The Capoeira Spot in D.C., and start my yoga studio. I added the Trap Yoga class to the two-hour regular schedule and it stuck. Those classes are our most popular classes at this point by far. It's getting people into other styles of yoga as a great introduction. Why were you nervous about blackness being accepted in the yoga community? The thing about a yoga studio is, it's not like a hospital where everybody who comes in has to be treated despite prejudice. Yoga studios are communities, and for me the greatest parallel that I've found for yoga studios in our community is the barbershop or the black church. It’s like a place where you know that there's an investment specifically catered to helping you. We don't have a lot of those spaces and I think that with yoga being this popular in the white community, it makes it easy for them to create spaces that are not as inclusive. Those things show up, not only within the advertisements but you also see that people who do go into the spaces verify that that’s what it is. You feel it, it becomes tangible. The disconnect from people — the exclusion is tangible. Even when you come in, people look at you. The same people that would be standing next to you in a Starbucks and wouldn't pay any attention to you, but as soon as you walk into the space you're looked at differently. I think that came from accessibility, the way that people that they shape it here [America.] A lot of people like to attribute things to yoga that it does not call for always. They want you to think that you need to listen to like ocean sounds, and wear all white, or be vegan in order to really do yoga or to be a part of what's called “the lifestyle.” That lifestyle is really not reflective of what the practice is about. The practice is: You can be on death row, you can be an old grandma, as long as you're breathing and joined the practice in order to meditate, you should be healed. It's not really about a lot of the things I think that we, instinctively or purposely, advertise about yoga. Even the word “yoga” doesn't lend itself to a definition. Until someone comes in and creates spaces that are specifically focused on black people or people of color, they won't necessarily feel and experience the community to the fullest extent. Of course I've been in studios that are white and I don't feel that all of them are trying to ostracize me. It's like going to white churches or restaurants, some people are cool but there are a lot of places where people aren't — that's the status quo. What are some things that you notice in your Trap Yoga classes? How does it impact the people who come to practice? It’s amazing because I've never seen a multitude of different bodies in the same room like this that are all black people. It’s also great to see someone who is maybe overweight next to somebody who's been doing this forever, or who's never tried it, or does it every now and then. The way that the classes are set up, it's like everyone should be working hard and everyone should be feeling it. The idea behind it is that it's a power yoga class, so in mirroring the trap music, it's intense. Honestly, while you're in the class, you don't really hear the music until you need to hear it because I'm talking. It may be in the background, but it becomes just that: background music. I'm helping you focus on your breath, and staying focused on the practice itself. It's interesting to see that people recognize, "I didn't even really hear what songs were playing." It wasn't the trap music that was working, it was just the fact that they felt the community ethic. Tell me about Black Girl Magic yoga class. Why did you feel the need to start it? Black Girl Magic Yoga was actually the brainchild of myself, and my partner and girlfriend Lauren. Lauren Turner: At the time there was the #SayHerName movement and we were having what we call 'Inhale Discussions' in our studio and throughout our classes. We would have talks on what was happening in the black community, particularly in policing in communities. We were talking about a lot about Sandra Bland and similar cases in which black women are being overlooked. So we were saying we should have a space where when these things are happening, all black people are welcome to come of course. Obviously in our trap class as well, but there's also a space particularly devoted just to the calming and spirit of black women. So we said let's just start Black Girl Magic, because everyone knows about us and how great we are, and how we all should come together and support each other. It's been great and we have awesome features, like Wanida Lewis. It's a very calming class, pretty much the opposite of trap yoga. It's extremely calming. Sometimes someone can even fall asleep, because it's Yin yoga — which focuses much more on the breath and staying the pose and sitting in it. We have all female teachers, all black female music. It's been a really positive class. Brandon, you also held some classes in response to the deaths of Alton Sterling and Philando Castile. Tell me about them. So the Inhale classes, I started doing these classes two or three Martin Luther King Days ago, with Randi Gloss. We taught yoga for 45 minutes and then had a discussion. The next year, and during that summer, Philando Castile was killed while I was on the way back from Atlanta. I remember he died, and Alton Sterling died at the same time. I was on a bus just really angry and anxious about the state of things. Feeling like, Why isn't there anything that I can do about this? I was tired of marching; I wanted to do something that was actually helpful for people that I could see. I was at the studio at the time and I had the power to do it, so I set up a couple more Inhale classes for Alton Sterling and Philando Castile that day. I just made it a free class the morning of and it was really healing. From there, we wanted to make that something that we did continuously, and that became Black Girl Magic. How important is the spiritual aspect of self-care for black folks? In what ways does it speak to our journey? It’s extremely important and it was one of my driving forces. Because, when I got into yoga, the power that I recognized was in it, was that it allowed for me to just grow. I think that it's really hard for us to just do that, because not only of the barriers that you have to be aware of in life as a black person in America, but in humanity. That's where your spirituality comes in and I recognize for us, this is something that you don't need anything in order to do. It seems like a very easy tool to get people to just to take a breath, be with yourself, meditate over a period of time. Just recognizing what you are, and where you are, and being okay with that. That’s why I am looking at yoga as a black thing to do because I think that once we embody that, or recognize that, we don't need anybody else. Namaste means the light in me recognizes and bows to the light in you. By light, we mean the creativity, the love, the God, the differences between us that make us valuable to one another. Your essence, your presence, just being yourself, for sharing that with me, the people in this room, the people in your own life that you don't even know that you affect. Thank you just for being who you are. I thank you and I honor you, and I encourage you to offer to your neighbor to your left and to your right 'namaste'." I think that the sad thing is that it has been shrouded — like a lot of things that are inherently good but shown to us by other races or people — as something that is unattainable. When you realize that spirituality itself, it's just there. Something that has made it very easy for me to share this with people, whether they really liked it or not, just to kind of know that once they do it, if they do it well and recognize in a way that their body understands, then they'll find the benefit of it. Even if they don't do yoga forever, they can meditate. They recognize that taking care of themselves is something they can do for free, and something they can do consistently.